I was just realizing that after a Monday post about a week in Las Vegas and a Wednesday post about Chianti-braised pot roast, we are having a boozey week here on A Squared. 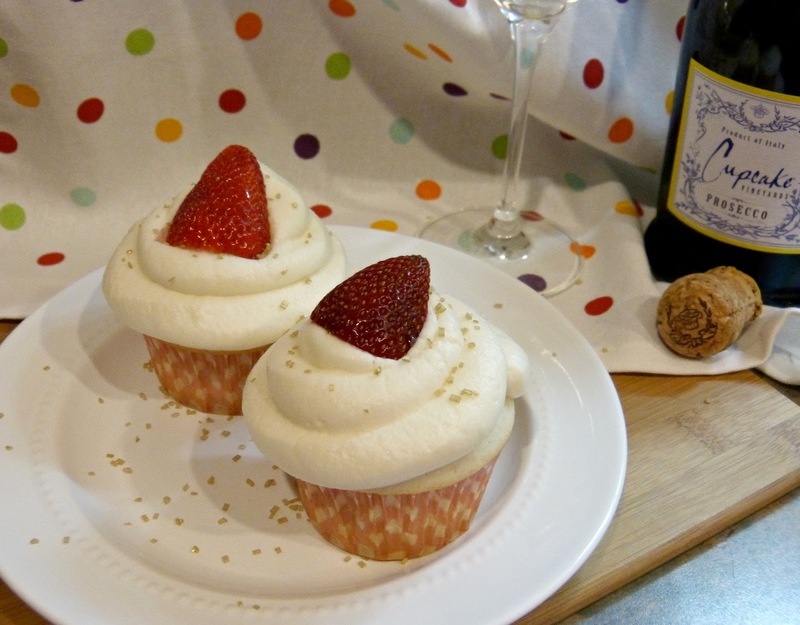 Let's end the week right with a recipe for Prosecco Cupcakes with Prosecco Buttercream Frosting! Last weekend we celebrated my dear friend Alexis's 30th birthday with a taco fiesta at the birthday girl's apartment followed by dancing and drinks at a rooftop lounge downtown. Since she was gracious enough to host us for dinner on her own birthday-- and because she's my bestie-- I wanted to make something special for her big night. And really, I think the only thing more festive than a Prosecco toast or a birthday cupcake is... a Prosecco cupcake. Alexis and I also love to enjoy a glass (or two) of bubbly on a Saturday night while we review our weeks with each other. It's sort of our thing. These cupcakes are unlike any that I have made before-- they are both firm and airy at the same time, if that makes any sense. And they are just sweet enough with a hint of prosecco flavor that sets them apart from your typical vanilla cupcake. Perfect for a celebration! My original intention was to frost these cupcakes with a fresh strawberry buttercream frosting, but that turned out to be an epic cooking fail... thank goodness I bought so many strawberries because after two failed batches of strawberry frosting (one that looked like pink butter and one that looked like Pepto Bismol), I had to send Alex out for more butter and sugar. I decided to scrap that idea and go straight for a Prosecco-laced version of my favorite buttercream frosting. The third time was truly the charm: this boozey frosting was sweet, creamy, and had a great tangy Prosecco flavor. It was really fun to watch people eat these and then realize "Oh, there's alcohol in these!" Warning: This frosting is for adults only! Sub in more milk for the Prosecco if you'd like to make this frosting kid-friendly. 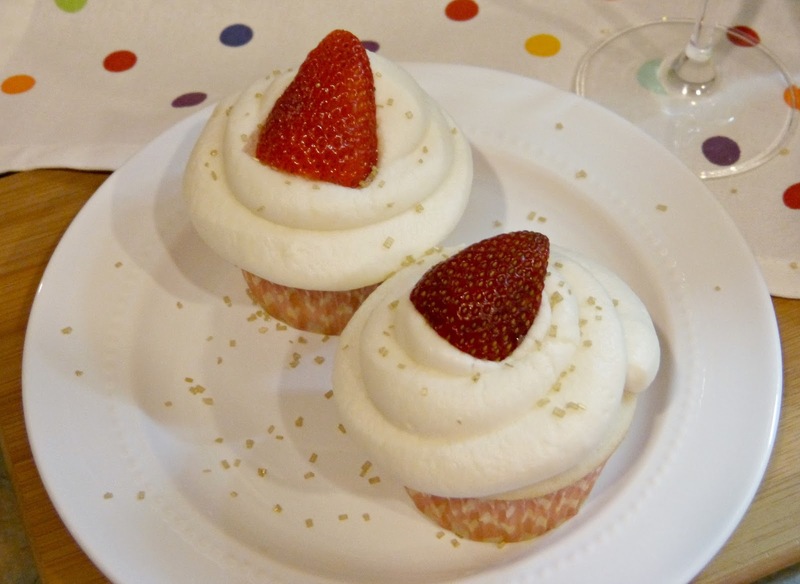 And since strawberries and Prosecco are a tried and true combination, I garnished each cupcake with a halved strawberry for some additional flavor and color. Preheat oven to 350 degrees. Line a muffin tin with cupcake papers and set aside. In a large bowl, cream together butter, sugar, and vanilla until very light and fluffy. In a separate bowl, sift flour, baking powder, and salt together. Add flour mixture into the creamed butter and sugar. Slowly pour in Prosecco while mixing on low speed until the ingredients are fully combined. In another large bowl, beat the egg whites for several minutes until stiff peaks are formed. Fold half of the whites into the batter until just incorporated and then fold in remaining egg whites. 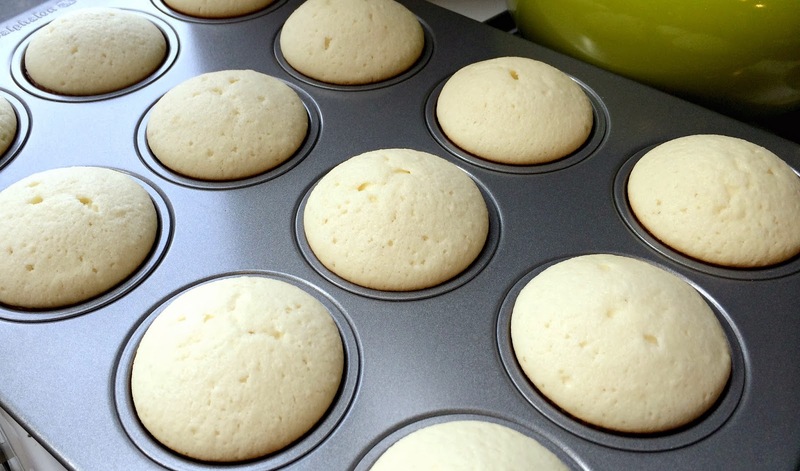 Pour batter into the cupcake liners and fill about 3/4 full. Bake for 20 minutes, or until a toothpick inserted into the centers comes out clean. Allow to cool completely before frosting. This makes about 18 regular sized cupcakes. In a large bowl, beat sugar, butter, vanilla, Prosecco, and milk until smooth. If necessary, add more milk until frosting is a spreadable consistency. Frost cupcakes as desired and place a halved strawberry in the center of each. Refrigerate immediately to firm up the frosting and serve chilled. *Cupcake recipe inspired by Gimme Some Oven. Looking for more creative cupcakes? Try Black Bottom Cupcakes or Confetti Cupcakes with Nutella Buttercream Frosting! These cupcakes were so much fun-- and perfect for a celebration! Let me know what you think! 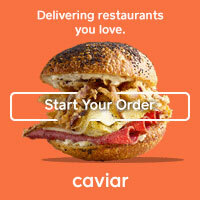 You say to serve refrigerated. Is this for flavour or does the frosting go runny at room temperature? Hi Shelleigh! Because of the alcohol in the frosting, it can get a little runny at room temperature. I also like to serve them chilled because that's how you'd enjoy a nice glass of prosecco too! Cheers!